A city mentioned with Hamath and Samaria, and compared to Carchemish (Isa. x. 9). Its identity is doubtful. It is named "Calneh" in Amos vi. 2; but must not be confused with the Calneh of Gen. x. 10. The latter was a Babylonian city, held by some to be the modern Niffer, by others to be Ctesiphon. The Septuagint seems to have disregarded this distinction; for, according to it, the tower was built in our Calno. 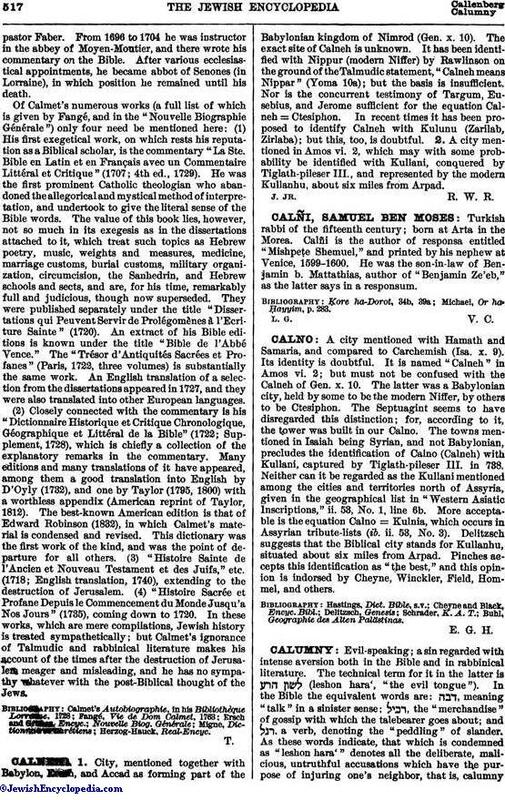 The towns mentioned in Isaiah being Syrian, and not Babylonian, precludes the identification of Calno (Calneh) with Kullani, captured by Tiglath-pileser III. in 738. Neither can it be regarded as the Kullani mentioned among the cities and territories north of Assyria, given in the geographical list in "Western Asiatic Inscriptions," ii. 53, No. 1, line 6b. More acceptable is the equation Calno = Kulnia, which occurs in Assyrian tribute-lists (ib. ii. 53, No. 3). Delitzsch suggests that the Biblical city stands for Kullanhu, situated about six miles from Arpad. Pinches accepts this identification as "the best," and this opinion is indorsed by Cheyne, Winckler, Field, Hommel, and others. Buhl, Geographie des Alten Palästinas.